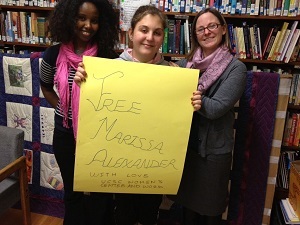 The movement to free Marissa Alexander and demand that all charges against her be dropped is growing! In honor of Domestic Violence Awareness Month, the UC Santa Cruz Women’s Center hosted the first event on campus about Marissa's case. Those who attended pledged to join the struggle. In anticipation of Marissa’s October 31 status hearing, WORD Santa Cruz gathered activists the Monday evening before the hearing at the main entrance of the University, a busy transportation hub, to pass out fact sheets and the number to call Prosecutor Angela Corey to demand the case against Marissa be dropped. WORD signs reading “Free Marissa Alexander Now” in English and Spanish and “Say No to Racism and Sexism,” with photos of Marissa, helped raise awareness about the movement to free her. Cars honked in support and many people took flyers and said that they would make a call to support Marissa Alexander. 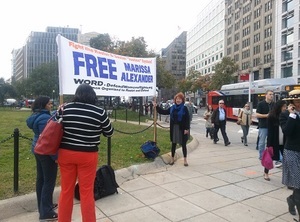 On the morning of Marissa's status hearing, WORD activists in Washington, D.C., did outreach during the busy downtown rush hour to spread the word about the case. Earlier in the week, activists in San Francisco and other cities did the same. Now is the time to intensify our efforts spreading the word about Marissa's case and demanding her freedom. Despite the fact that the original guilty verdict was overturned, Florida State Attorney Angela Corey is moving ahead with the unjust prosecution of Marissa Alexander. At the status hearing on October 31, a bond hearing was scheduled for November 8th and a new trial was set to begin March 31, 2014. Marissa's new trial is taking place in the same venue where she was originally convicted of aggravated assault. She was sentenced, under mandatory minimum sentencing laws, to 20 years in prison in the same state that let George Zimmerman walk free. There is no crime in defending yourself from abuse. Marissa Alexander acted in self-defense and injured no one. She is a survivor of domestic abuse, and is only imprisoned because of this racist and unjust legal system. Marissa Alexander should not be subjected to a second trial. All charges against her should be dropped immediately.